Wow, Gameweek 27 and 28 zipped past pretty quickly didn’t it?! Luckily for all of us FPL managers, there’s Gameweek 29 right around the corner and it is full of some massive fixtures! Nathan and Joe chat about Manchester United’s injury plagued squad and how it’s best to manoeuvre around their ever growing list of sidelined stars. Is Lukaku actually the answer to your fantasy football needs? Plus, there’s more chat from the lads around Leicester with player such as Vardy, Gray and ... See More Maddison looking even more like a trio of top picks. Don’t miss Fantasy Football Pundits’ pick of the week too, who provided the boys with another player they think is going to be vital to your Gameweek 29 success. 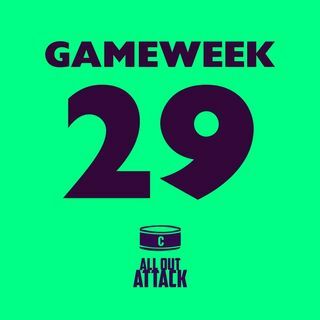 Subscribe, give us as many stars as you can fit in during the time it takes for Ben Mee to score a hattrick and follow us on Twitter at @AllOutAttackFPL. Thank you, enjoy and as always good luck in Gameweek 29.